An Ipswich Sparrow feeding in cordgrass near the south beach in late October. Since the late 1960s, banding has been used in various studies of the Ipswich Sparrow on Sable Island. In September 2017, researchers from Dalhousie University (Halifax) and Acadia University (Wolfville) began a long-term study of the population using mark-release-resight techniques. Individual sparrows are identified by unique combinations of coloured plastic bands. There are nine coloured bands in use on Sable: red/white split and black/white split (plastic split bands are used with a metal band on the right leg); and red, orange, yellow, green, blue, black, and white (three of which are placed on the sparrow’s left leg). The red/white split bands were used in 2017, and the black/white split bands were used in 2018. In this project to date, 579 sparrows have been banded on the island (265 in 2017, and 314 in 2018). Also, Ipswich Sparrows have been banded on Delmarva Peninsula, part of their wintering grounds along the east coast of the USA. 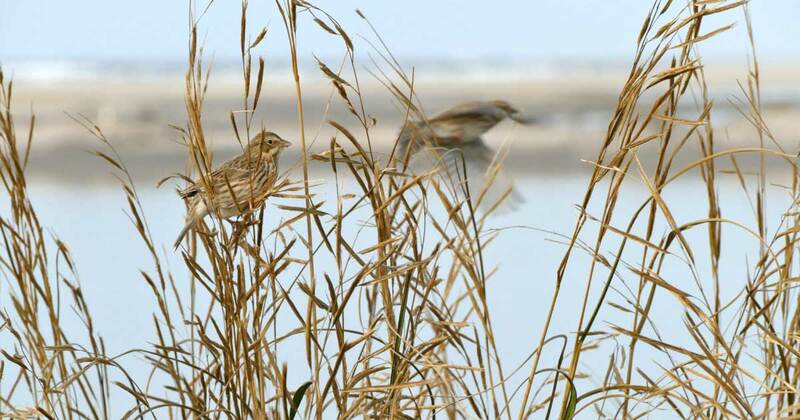 Banding will continue in these two locations for several more years, and resighting surveys—searching for banded individuals—will be done in numerous areas along the eastern seaboard. Resighting data will provide insights regarding life cycle stages of Ipswich Sparrows (breeding, migration, and overwintering), and will assist with estimating population size.